Copyright   : Copyright (C) 2012 everyone. A Gedit plugin is composed of just two files: a library (.so) and the plugin file definition. In order to make the example really simple we decided to implement a very basic function: the plugin will just close an xml tag upon writing the ‘>’. Eg. if you write it will add the corresponding close tag. For the past six months, pacman’s package verification features were turned off by default while we were figuring out the details of our public-key infrastructure. This sets up a local keyring for pacman, and populates it with the data needed to authenticate official packages. This includes five master keys used to authenticate Arch Linux packagers (developers and trusted users), so you do not need to know who joins or leaves the team: you only have to verify those five master keys once and for all. The populate command will prompt you to do so; please do this cautiously by checking the fingerprints displayed against those published on our website. Then, merge your pacman.conf with pacman.conf.pacnew, that is, enable package verification through the SigLevel option, and you should be good to go. For details on the development of pacman and archlinux-keyring, see the blog posts of Allan and Pierre. 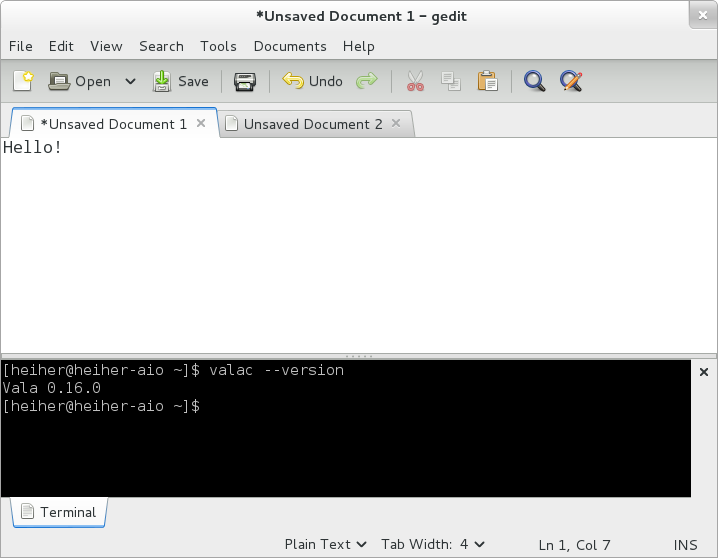 Vala supports D-Bus inter-process communication using the GDBus API that is part of GLib/GIO since version 2.26. Vala automatically transforms Vala style lower_case_names to D-Bus style CamelCaseNames behind the scenes. You can use methods, signals, properties in D-Bus objects as if they were Vala objects. * is called 'name =' for historical reasons. The methods of the client interface must be defined with throws IOError. The timeout will change the property every few seconds. The notifications can be visualized by the terminal program ‘dbus-monitor’ that comes with most distributions.